Overnight and early trading on Crude was up - bolstered by the performance of the Chinese Markets (they went up instead of crashing hard enough to trigger the circuit breaker this time). US Stocks, bonds and equities all climbed along, and it looked like today was poised for a rally, or at least the proverbial "dead cat bounce"
However, once the temporary amnesia wore off, Iran coming back online came back into play and the markets took a beating across the board. WTI Crude closed out at $28.46 - slightly below the $28.50 sub-$30 benchmark some analysts had projected (or more likely hoped) would be the new "bottom". That remains to be seen. ULSD followed suit with WTI, dropping .0256 to settle at $0.9087, while gas was up 50 points to stay in the $1.02 range ($1.0262 to be precise). Stocks unfortunately also followed suit with WTI - as of writing the Nasdaq, Dow Jones, and S&P are all down - keeping 2016 in the red as it has been thus far. The EIA inventories later this week could have a major impact, particularly if there are builds. Most predict draws, but a build on gas could be significant as we could in theory see RBOB follow ULSD below the $1 benchmark. Will Crude Break $30? Will RBOB follow ULSD Below $1? Yesterday, Crude briefly dipped below $30 per barrel for the first time in 12 years, before closing slightly over at $30.34. Crude was up on the overnights, as a result of the API forecast projecting draws of close to 4mmb. The EIA report this morning, however, quickly reversed the market trajectory when it showed a build of 230K barrels. 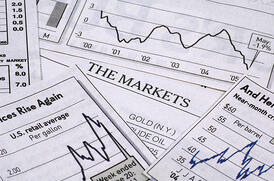 A modest increase, but the market registered it as significant in the face of the projected draws - at least initially. 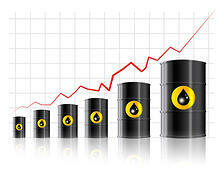 At the close, Crude was essentially flat, up slightly to $30.48/bbl. Despite the slight edge up today, so far Crude is still down almost 15% since the end of 2015. On the refined products side, analysts correctly projected builds in gasoline - sort of. The expectation was a build of 1.6mmb but EIA data indicated an astounding build of 8.4mmb which sent RBOB tumbling, especially as it comes on the heels of last weeks 10.6mmb build. On top of product builds, gasoline consumption is down a little over 4% compared to this time last year, which is also weighing on RBOB. At the close today, gas was down over 3, settling out at $1.0528. Two weeks ago the debate was would RBOB break $1.10 - now it looks like the question over the next week or so could very well be "will RBOB follow ULSD below a dollar?" Distillates showed a build of 6.1mmb as well, and this on the heels of ULSD dropping below $1 on the screen, following its drop on the cash markets. Tuesday broke the $1 level - closing down .0248 to $0.9901, and today ULSD shed another 2 to settle at $0.9694. In addition to the build, distillate consumption was reported as being down 12% versus this time last year, partially as a reflection of the precipitous drop in heating oil usage due to our unseasonably warm weather. On a macro level, the Chinese economy continues to stumble, and US stocks continue to get battered as they essentially have been since the opening bell of 2016. Today, as of writing, the Dow is down over 300 points, the Nasdaq is down triple digits as well, and the S&P is officially in correction. Additionally, as mentioned before, the ongoing standoff between the Saudi's and Iranians after severing diplomatic ties ensures that at least for the time being, OPEC production will remain at record levels. Add in the unseasonably warm weather and the drops in demand/consumption across the board, and all of the sudden that "crazy" projection by some that we could see oil in the $20's doesn't seem so crazy after all. Thursday saw prices tick up after it was reported that the Saudi's output dropped from 9.69 million barrels to 9.36 million barrels. There has been some chatter and concern around the scheduled OPEC meeting in November. The concern being that OPEC will push curbing supply to stop the price declines we've seen in recent months. Brent Crude was up 3% on the news, the highest its been in 4 months. However, despite the OPEC chatter, the Saudi's have said they will keep output at scheduled high levels even with lower pricing to maintain market share. Additionally, reportedly only a small number of members have suggested supply curbing. US Inventories surged on this weeks EIA report as well, up 7.1 million barrels to a little over 377 million barrels, which was about twice what analysts predicted, and hopefully helps to calm some of the potentially unfounded fear of OPEC that's pushing volatility. 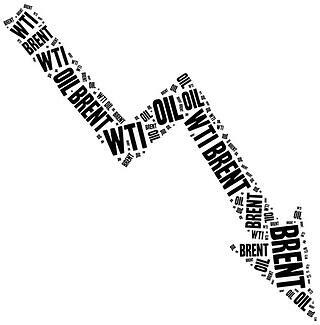 If we look back, the 20% drop in crude pricing we've seen over the past several months have been directly related to an abundance of supply, and with US oil production surging ahead, and the Saudi's not indicating they will initiate any sort of hold back to drive prices up, the situation remains the same and the volatility should back off. However, it's possible that some roller coastering will remain until after the meeting, when its officially settled whether or not we have to worry about supply curbing. The market seems to concur today, though, with both Brent and WTI trending back downwards. 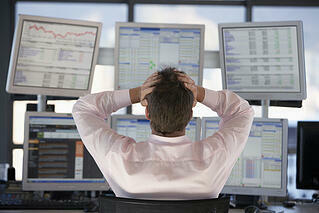 ULSD & RBOB are trending down on the NYMEX today as well, down about a penny and a half on both at the moment. Both products closed up significantly yesterday - ULSD +.0256 to 2.499 and gas up +.0513 to 2.2069, which effectively cancelled out Wednesdays drops of .0398 and .0578, for those keeping score at home. Both Brent and WTI shot up 2% today on last nights news that ISIS insurgents in Iraq captured Tikrit and Baiji, and were continuing their march towards Bahgdad.If you were watching the screen, you also saw ULSD shoot up .085 to 2.9893 and RBOB hit 3.0837, up .0829 on the day in reaction. Iraqi production levels have been stable around 3 million barrels per day, making Iraq OPECs second largest producer (behind Saudi Arabia) - so the supply concerns we're seeing push prices up at this intensity level are not unfounded. 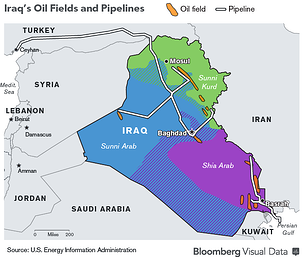 Essentially all of Iraq's oil production comes from the southern, Shia portion of the country by Basra, (see map from Bloomberg above) where militant influence is essentially non existant (at least in comparison) - so some speculate that even should the Baiji refinery or additional cities fall, actual supply is unlikely to be affected as the area is well guarded and safe. However, it pays to keep in mind that no one saw Mozul or Tikrit being as vulnerable as they apparently were - the invasion of Mozul saw over 500,000 people flee the city in 12 hours, including basically the entire coalition of American-trained Iraqi security forces because of the level of violence and choas that erupted. It's less likely that would happen further south, given the relatively small insurgent force and the steeper odds they would face in terms of fighting back - but its certainly not an entirely unreasonable fear. The Obama administration has stated they are "considering all options" - air strikes, drones, etc but have not made a decision at this time. It would seem unlikely that an attempt to garner public support for re-entrance to Iraq would be an easy (or possible) task, all things considered. Ironically, the air strikes on Syria that the administration faced such backlash for last year were directed at stopping the violence in the area that involved ISIS - the same group now surging in Iraq. Not a good sign for approval for Iraqi strikes. Thus far neither the UN or US has said they will step in to aid the Iraqi government - a fact that it certainly not easing concerns in the market, one would think. In the grand scheme, considering price volatility and levels as a whole, we're fortunate that some areas (like the US) have seen production booms that have offset some of the drop offs from OPEC nations (mainly Libya) as its helped keep prices overall more stable - the jump in 2012 for example would probably have shot way past a 2% spike. If supply gets disrupted in Iraq though, given its the second largest OPEC producer, that may cease to be the case, which is probably the more far reaching concern pushing prices than isolated fighting would on its own. Sino-Russian Gas Deal, Ukrainian Post Election Violence, and Contracting US GDP Numbers - Oh My! This week the market once again bounced around on conflicting data - likely to do with inventory numbers versus economic growth (actually a lack thereof), demand projections, Ukranian violence, and a whopper of a Nat Gas deal between Russia and China. So much for a nice quiet 4 day week, hmm? Internationally, Ukraine saw an explosion of fighting and casulties above and beyond what we have seen thus far in the wake of the Presidential election (which went to Petro Poroshenko, former foreign minister). Poroshenko reportedly stated he would deal with the rebel forces in "hours not months" and vowed Ukraine would refuse to aknowlege Russia's annexation of Crimea. Thursday the 29th saw helicopters shot down, killing 12 Ukrainian soldiers, and over 100 people killed in a second airport assault. Like we've talked about, bad news for Ukraine is bad news for Brent generally, and Thursday was no exception, it shot up over 35 cents on the ICE - but dropped back down today - it looks like it will settle the month out up 1.3% but down around 1% for this week. 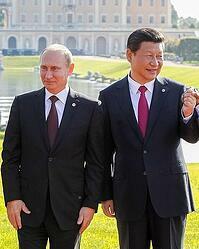 Russia and China signed a $400 Billion (with a B!) 30 year gas supply contract this past week as well. The Moscow newspapers claim the deal is not just about Ukraine (although they admit its a tipping point). Merryl Lynch's analysis is that the deal is a good move politically, but may not be the best business deal going. With the EU market shakier for Russia's Gazprom over Ukraine, and the EU also looking into alternate supply options/relaxing regulations, it may well prove to be a good deal in the long run business wise as well, though. 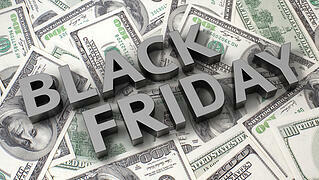 The deal was also somewhat inevitable, given the Chinese demand levels and proximity. It also takes the wind out of Canada's LNG-exportation-to-Asia sails to some degree, or at least gets Russia ten steps ahead in the Asian markets. An unintended consquence for the EU though is that now they are under pressure to actually diversify supply, not just threaten to. Be careful what you wish for, right? On our side of the pond, the news was more peaceful but not much more positive. The Bureau of Economic Analysis released its revised data on the US GDP for the first quarter of 2014. If you recall from our discussion last week, most people were not thrilled to hear the original number of GDP growth at 0.1% for Q1 - and now, the revised numbers actually show US GDP at -1.0%. Personal income and personal spending levels both barely increased at all (0.3 and 0.2%, respectively; and home sales fell 60% short of estimates. On the other hand, both the S&P 500 and the Nasdaq 100 hit all time highs. Go figure. US Crude inventories were up again - but down again at Cushing, which should have supported (in theory) the current WTI pricing. Thursday saw prices up on the inventory news as traders zeroed in on Cushing levels, versus the overall supply increase. Distillate stocks were down and Gasoline supplies fell by 1.8 million barrels, despite expectations that we would see builds in the 200K barrel increase. This pushed gasoline up during trading yesterday, specifically on July trading, although at the close it crept down to only a 77 point gain. ULSD ended up closing down over a penny (-.0116), and both RBOB and ULSD are down today on demand expectations based on the horrendous GDP revised numbers published this week (more on that later). This number has an across the board impact because the US is the number one consumer of petroleum products, and a slow economy indicates lower demand and therefore lower prices. Essentially, it appears that because there are so many different factors at play domestically and abroad, they're sort of cancelling each other out (at least most days) and keeping pricing within the range we've been seeing for a while now. This will probably continue until either the US economy rebounds, the Ukrainian crisis abates, or some other wrench gets thrown into the mix. Stay tuned!